If you’ve scrolled through your social media feeds lately, then you’re well aware of just how popular holographic makeup is. What once was reserved for Halloween has now secured its spot as one of the biggest beauty trends year-round. Also known as galaxy makeup, holographic makeup is all about rocking iridescent shades all over your face—in essence, it’s a makeup trend that’s totally out of this world. Want to try holographic makeup for yourself? Keep reading to learn about our best products for creating a galaxy makeup look, how to find the best holographic makeup shades for your skin tone, and where on your face to apply holographic makeup. Ready to take your makeup look to the next level? Pick up one of the holographic highlighters from our L’Oréal Paris Infallible Galaxy Stick collection, available in three shades: Astro Blue, Cosmic Pink, and Galaxy Gold. Apply the highlighters to the high points of your face to add dimension and luminosity. Glide them over your cheekbones, cupid’s bow, and collarbone for a holographic highlight. You can use them on bare skin or apply them over the rest of your makeup—it’s up to you. Just remember, the key to pulling off a galaxy makeup look is to apply your holographic highlighter with a light hand—that’s what prevents this look from giving off All Hallows’ Eve vibes. Now, on to finding the prettiest holographic highlighter for your skin tone! If you have cool undertones…try the L’Oréal Paris Infallible Galaxy Stick in Astro Blue. The iridescent, ultraviolet pearls in this highlighter offer an icy-cool highlight meant to brighten any skin tone—but we’ll be the first to say it looks especially pretty on cool, pale skin. If you have warm undertones…try the L’Oréal Paris Infallible Galaxy Stick in Cosmic Pink. Infused with purple holographic pigments, this cool pink highlighter pairs beautifully with all skin tones—especially warmer ones, since pink is a traditionally warm hue. If you have neutral undertones…try the L’Oréal Paris Infallible Galaxy Stick in Galaxy Gold. If you don’t have any noticeable cool or warm undertones, you can rock any holographic highlighter shade with ease, but we recommend gold shades in particular. This champagne hue has a hint of rose that can help you create a truly head-turning galaxy makeup look. Now that you know which holographic highlighter shades will flatter your skin tone best, it’s time to learn how to apply them for a truly wearable makeup look. Keep reading to learn everything there is to know about holographic makeup application techniques. Before you know it, you’ll look like an out-of-this-world space cadet in all the best ways. If you love highlighter, why not make use of one with a holographic finish? All you have to do is swipe your Infallible Galaxy Stick in an upward motion starting just above the apple of your cheek and working your way toward your temple. Be sure to use your fingers to help blend out your highlight for a makeup look that’s subtle enough for everyday wear. If you want to keep holographic makeup confined to one area of your face, use your finger to dab some shimmering color onto your lids while leaving the rest of your face bare. We love the L’Oréal Paris Infallible Paints Metallics Eye Shadow in Violet Luster. Not much of an eye makeup kind of gal? Opt for a holographic lip instead! Instead of reaching for lipstick, simply swipe your Infallible Galaxy Stick across your lips and top it off with a little lip gloss for added allure. You can also pop on the L’Oréal Paris Infallible PAINTS/LIPS Metallic in Galactic Foil for a shimmery plum hue. 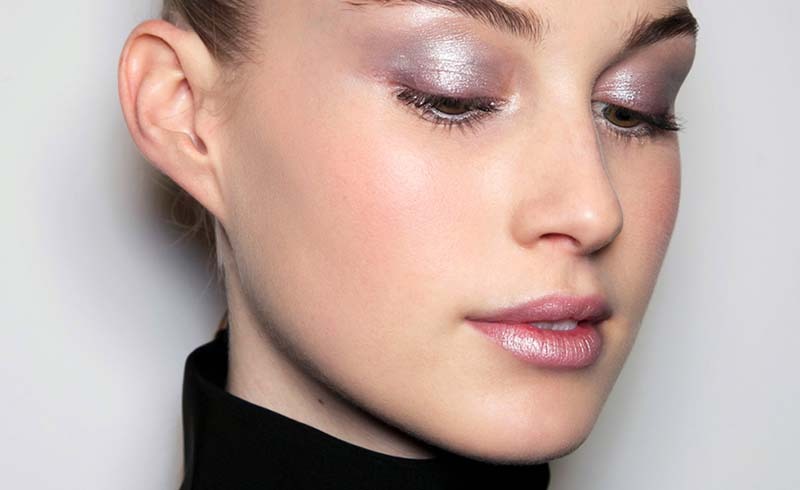 Last but not least, you can create a radiant, dewy makeup look—with a holographic twist! Simply dab your Infallible Galaxy Stick along your cheekbones, cupid’s bow, and the tip of your nose before using your fingers to apply the tiniest bit of holographic highlighter to the inner corners of your eyes. Gorgeous! There is no single answer to the best way to complete a holographic makeup look. You can go holo all over, pick one holographic accent to complement matte face makeup, or—our favorite option—pick a single holographic statement to make, then finish your look with a few spritzes of an illuminating face spray. We’re fans of the L’Oréal Paris True Match™ Lumi-Shake and Glow Dew Mist.